We have many options to customize our Android device, such as the wallpaper, font size, brightness, etc. We can customize nearly all the features of our device, so that it will perfectly suit our personal preferences. Let’s see here the steps to configure various options all related with the screen. Some are aesthetic (as the wallpaper), while others affect directly its performance (how the waiting time before the screen turns off or brightness. 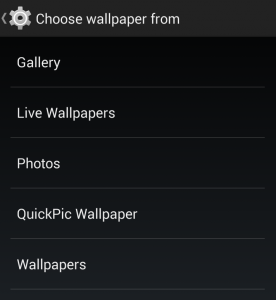 Changing the wallpaper on Android is easy. We just have to go to “Display” in the “Settings” menu. Once there, we will see the option to “Wallpaper”, from where we can choose the kind of background we are going to you want to use. 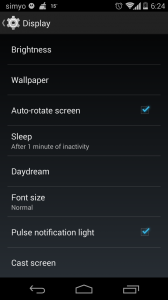 We can easily adjust these options from the menu screen, where there are the options of “brightness” and “sleep”. These two options are very important because the display is largely responsible for the battery consumption. The screen is what consumes more battery in our system, and adjusting the brightness and timeout can help to lengthen or shorten its battery life. On the menu screen we have also the option to change the font size. 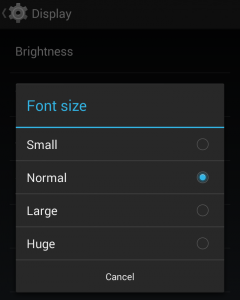 By default, the device is configured to display a “normal” font size. With this option, you can choose between small, normal, large and extra large. In addition, there are some applications that allow us to better adjust the font size, adapting the device so it can be used by people with vision problems, elderly people or children. An example is Big Launcher, which you can find in the Play Store.